PHOENIX (Nov. 19, 2013) — Descubre Phoenix, metropolitan Phoenix’s official visitor center in Northern Mexico, recently celebrated its grand re-opening after relocating to a newer, busier location in Hermosillo. The south-of-the-border visitor center is an extension of the destination marketing organizations in Arizona, such as the Arizona Office of Tourism and Visit Phoenix. Visitor-information specialists at Descubre Phoenix also book hotel and resort accommodations and sell tickets to sporting events and concerts in Greater Phoenix. The visitor center’s new location is on Boulevard Morelos, which has become one of Hermosillo’s busiest avenues; it is lined with restaurants, boutiques, restaurants and storefronts. On hand to celebrate the debut of the new Descubre Phoenix were representatives from the Arizona Office of Tourism, Visit Phoenix, Tempe Tourism Office, Chandler Office of Tourism, the AZ/Mexico Commission and the Sonora Office of Tourism. 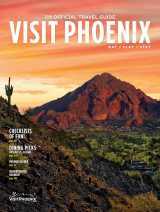 Descubre Phoenix’s move to new-and-improved location dovetails with the Volaris Airlines’ new service to Phoenix. Volaris, Mexico’s largest low-cost airline, now offers three nonstop flights per week to Phoenix from Guadalajara. One-way fares start at 2,169 pesos ($166 USD), with advance winter fares as low as 1,993 pesos ($153 USD). That’s cheaper than a luxury bus ticket to Phoenix, and the flight time is only 2 hours, 45 minutes. Volaris also will begin weekly service between Mexico City and Phoenix beginning Dec. 4. According to officials at Phoenix Sky Harbor International Airport, the addition of the new Volaris flights means Phoenix’s airport — one of the 10 busiest in the United States — now serves 10 Mexican cities with 15-20 flights per day to the region. Phoenix officials—including Mayor Greg Stanton—participated in Volaris’ maiden flight from Phoenix to Guadalajara, where Visit Phoenix hosted a reception for representatives of Mexican travel agencies.